(VIDEO) A New Year’s Message from His Majesty King Harald V of Norway. On December 31, 2016, the Norwegian royal court released a video of His Majesty King Harald V of Norway’s traditional New Year Speech. Below is a rough translation of His Majesty’s message. In summer we had a very special tree in Slottsparken. We called it Ønsketreet. There were people who visited the park invited to hang their hopes and wishes for Norway and the world. Throughout the summer flickered people’s wishes in the wind. More and more came. The branches of the old tree hung heavy with the hopes of children and adults, young and old, Norwegians and foreign tourists. For me it was nice to see that many of the wishes of the people expressed fallen well with my own hopes and wishes for our country and the future. 2016 was an eventful year filled with gratitude for us. On the occasion of our 25th anniversary as royal couple, we experienced Norwegian hospitality and warmth at its best – through meetings with people on anniversary trip along the coast, and on the many garden parties held. The Queen and I want to thank warmly for all the great memories that are created through this special year. One of my greatest wish is that we will continue to meet in freedom, without fear and barriers, without fences that creates distance. It is one of the most important values in our Norwegian, open societies. I think that was a wise desire. Many feel that it produced such great demands on them that they are mentally and physically exhausted. But my impression is that many of the claims also made by ourselves. We struggle us simply out by thinking that we are inadequate. One of the most important for us people think I’m getting to feel that there is use for us. Getting feel useful, to get accomplish a good day’s work. Many who experience to stand outside the labor market, know enough left in this. This year we marked the 50th anniversary of the discovery of oil on the Norwegian Continental Shelf – with all the wealth it has created for Norway. Meanwhile, many just in this industry lost their jobs. I’m impressed with all the will of creativity and change that I’ve seen and heard about this year. One of my wish is that we will be able to see and embrace all the human resources in our country. Everyone can feel that they help and recognize themselves useful – regardless of age, gender, ethnicity or disability. Another wish on the tree was written by a girl and a boy together. “I wish that we make it safe for women to live in Norway – and that we must be spared to ask about this several times,” it said. Our community should be safe for everyone. Specifically, we must work to ensure that the most vulnerable are protected best. In 2015 adopted the world leaders the new sustainability goals for creating a better world. One of the goals is about combating violence against women and children. In this area, acknowledged Norway that we must make an extra effort in our own country. If we are to create a safe society for all, it is important that it gets put into words what is happening, and that those who are able to help, is wise listeners with strong vigor. A tree is a nice picture of this. The roots are heritage and traditions. The tree above ground constantly exposed to influences that require maintenance throughout the changing seasons and life stages. As long as the tree lives, dig roots slowly deeper and deeper. In Norway, many traditions, both religiously and culturally determined. Several of them are linked to the Christmas holidays we have just celebrated. From tomorrow – 1st January 2017 – the Church formally separated from the state. Simultaneously we mark that it is 500 years since the Reformation, which had great significance for the whole society. It is important to our roots conscious – and give new generations the opportunity to understand the references in our culture. This concerns both the history, religious traditions and narratives, myths, fairy tales, music and visual arts. In any culture, in any country, is aware of this heritage helps to make us more whole as human beings. There is a wealth that helps us to know that we belong to a place and does not live in a vacuum. That we have been influenced and inspired by the same sources that people who have lived before us. This we experienced when we last invited to multi-religious feast at the Palace. When we shared thoughts, cultural expressions and food from various religious treasure chests, we came closer together and understand each other better. It is my hope that we are also in a time of ever new impulses gives space to go into our own treasury and make the content live, for ourselves and each other. My experience is that by standing confident in awareness of their own heritage, one can easily meet others with an open mind. The Queen and I was reminded of our anchor during the anniversary church service in the cathedral on June 23 – which marked that it was 25 years ago we were blessed just there. To have God’s blessing upon the deed our – and getting kneel where both my father and grandfather had previously received the same blessing, perceived as a major force. Youth expressed that they want stability, presence, calm and good conversation. It has always been challenging to be youth. But I sincerely feel the youth of today who are facing so many more choices and so much more external influence and pressure than was the case for only one or two generations ago. In the midst of this I am deeply impressed by many young people. You are role models for us seniors who have failed to engage enough in topics such as the environment and wealth distribution. Many of the patches on Ønsketreet – especially the youngest – express hope for less litter and better climate. The social consciousness and conscience I meet with many of you who are young today, makes me very optimistic about the future. “Maybe. But my dream starts with you. “When the boy was silent. If we have good dreams for each other, if we want each other well – then much magic happen. It’s good for us to ensure that others can thrive. Both in the community our in Norway and as world citizens. A special thanks tonight I would inform all of you that are in service outside the country – and who might miss family and close friends exactly tonight. Thank you for the efforts you make through diplomacy and humanitarian organizations, the police and defense – for peace, stability, health and safety for fellowmen. The Queen and I fill 80 now this year we go into. For us it’s a little unreal. Like so many older experienced before us, one feels the rare as old as the number indicates. It gives us great pleasure to meet so many people who make an impression on us, giving us new ideas, which gives us the image of the new Norway – with its opportunities and challenges. People we hope and believe will be able to build the country further on values such as trust, fellowship and generosity. People that will characterize our society with its great effort and great knowledge. Life has taught me that it is most important to us humans do not change very much over time. We need someone who cares about us. We need that there is use for us. We need to be seen – and recognized – for who we are. We need that someone has the time to listen and be present. We need to know that we are here for something and someone beyond ourselves. That we who share this earth recognizes that we are primarily fellowmen. That we can collectively decide to work for a healthier world. Choosing to fight evil with good. Well, it is that time of year again. The fantastic Norwegian network, NRK, released Året med Kongefamilien 2016 (A Year with the Royal Family). HRH Crown Princess Mette-Marit of Norway Visits the Realfagsbiblioteket at the Universitetet i Oslo. On the morning of November 30, 2016, Her Royal Highness Crown Princess Mette-Marit of Norway visited the Realfagsbiblioteket (Science Library) at the Universitetet i Oslo (University of Oslo) in Oslo, Norway. During her visit the future queen of Norway was given a tour of the fantastic library as well as met with undergraduate students. Please click here to view a photo. 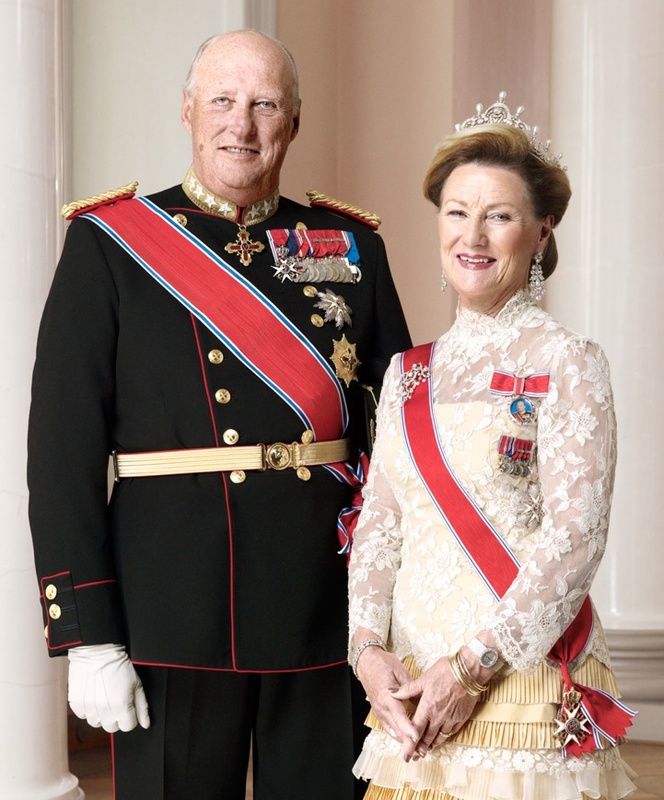 (VIDEO) His Majesty King Harald V of Norway Delivers His 2015 Nyttårstale. On the evening of December 31, 2015, His Majesty King Harald V of Norway delivered his 2015 Nyttårstale live from the Kongelige Slott in Oslo. Below is a rough translation of His Majesty’s speech. They were forest guys and mountain glove. Our days pass into months – that goes over this year. Thus the years life. It is in every day life is lived. And for most people in Norway is the good life. Sometimes, one can still feel alone. Maybe you lost someone, perhaps one stands in front of an important choice. May make stance you a little shaky, and you do not know where the next step should be. If you look back, you can easily get balance. How can the past – and they went up the slopes – helping us to locate. I will therefore speak about the long lines tonight. Norway is regarded by many as the best country to live in. We score high on international rankings of living standards in the world. We have a good welfare state – and the vast majority have a job to go to and confidence in daily life. It has not always been. This year we have highlighted that it is 70 years since peace came to Norway – after five years of war and occupation. A number of events have been held to commemorate the end of World War 2. Several of these we have in Royal Family attended. The markings have given us an opportunity to look back – and in some cases also to put today’s society in perspective. For it can be easy to forget that only 70 years ago parts of our country lay in ruins. Many returned to broken homes, and several came from a refugee existence. With assistance from the Marshall Aid we built the country after the war. The Norwegian effort that created the gleaming new home and a working life with the need for many hands. Over the decades, we have developed a model of society we can be proud of – with low unemployment and a labor market in which the parties cooperate well. In the late 1960s we found oil in the North Sea. Wise politicians and visionary leaders created a sensible framework surrounding the management of the large new resource. The sum of all this is a generous welfare state everyone can enjoy. Benefits we now take for granted, has not always been obvious. We also experienced adversity and faced challenges. Together, we have nonetheless emerged us up uphills. 70 years may seem long, but for many of us living today, it’s as if it was yesterday. The long lines are broken up by milestones; signs showing the limits. They are a symbol of that thing ends and something else begins. “The Past best gift is the memory of that we have a future,” the sociologist Michael Young said. In the old days mark stones also sightlines; a place where you could plot the course. In a human life are milestones often occasions dealing with important events: A child’s birth. Choice of partner. A new home. Life events that give direction, new hope and sustenance to our dreams. Some such occasions will characterize you as long as you live. One of my most important milestones was laid in 1991. When my father, King Olav V, passed away the night of January 17, 1991, began my king. In the dark January night nearly 25 years ago, the Palace Square filled with light. People came from near and far to commemorate a beloved king. My royal deed started with a sense of community. The warmth of a whole nation embraced our family and gave strength in a difficult time. Meanwhile, it is with great humility that I stepped into a line of revered kings before me. Year we are now entering will mark this 25th anniversary and gives occasion for reflection and contemplation. Norway has in these years experienced an unprecedented prosperity. Our country substantial access to energy and ocean treasures has given us great riches. Nevertheless, it is not natural resources alone that has given us opportunities – but to a greater extent our common human resources. Because many are participating in the labor market and thus contribute to the community, we are together helping to create prosperity all benefiting. Many people today are concerned about how the future will look like. In recent times we have several areas experienced being tested – as a nation and as individuals. It is allowed to be upset, and express it. Norway is closely linked to other countries. How can events on the other side of the globe have significant consequences for each our days here at home. Some occupational industries are threatened, and the employee can have serious consequences. We have recently heard of layoffs in several places. I would think that many tonight are concerned about what happens to their work in the future. Human drama we see every day in the faces of all those trying to find a safe haven in Norway. Many fleeing terror in their homeland. Autumn’s horrific events in Paris and other big cities have been dreadful reminders that values ​​our society is built, are under pressure. Terrorism knows no borders, and the goal is to create fear in the population. The terrorists want to rob us of life – our life. We will fight – with different agents. Where terrorists are attacking our lives with bombs, is our best defense, however, that we use values ​​as weapons. As a backdrop for today’s great themes, hangs the threat of climate change. From Alaska to Antarctica, I’ve even seen some of the consequences. Fortunately, there are bright spots. The international community’s effort to reach an agreement at the climate summit in Paris, ended considerably better than many had feared. Now begins the laborious work for a healthier planet. We may have different opinions about how we should handle our common challenges. Nevertheless, it is important that we can talk about the tasks, because we are all affected by them. If we look back, we remember that we have been through difficult times before. We mobilize the opposition. Norway is perhaps a small country, but together we have accomplished great things. After the terrorist attacks against Jews in Paris and Copenhagen in the beginning of the year, took a group of young Norwegian Muslims initiative to create a ring around the synagogue in Oslo. It was a simple and very dramatic action that showed courage and dedication through to care about others. This autumn’s major refugee flow has reached us up close and personal life. Throughout our continent is experiencing a major challenge to welcome them back in a good way. Many people across the country have collected and handed out clothes and food, taught in Norwegian and opened their homes to those who need it. Spontaneous action – and an expression of compassion. How have people been seen and important community building. I will tonight give a special thanks to the Norwegians who are in other countries to help people in need, and contributing to efforts to achieve peace and stability. Women and men in the armed forces, police, diplomatic and humanitarian operations and organizations doing important work we can all be proud of. My thoughts tonight also goes to the families and those affected by avalanche accident in Svalbard right before Christmas. Volunteers and relief agencies also did here a big effort to help those affected. When we in the Royal Family visiting around the country, we are struck by people’s enthusiasm and commitment. Communities are built in a country populated by people with visions and thoughts that Norway someday be left to our grandchildren. I am therefore optimistic. If we can still be true to, and can still develop our values ​​- such as trust, community and generosity – we can still create a good society for the many. Often it is the case – we know not always how it goes. Soon we will enter a new number in the calendar. Together we will experience the ups and opposition, sorrows and joys. Each individual will experience new milestones in his life; dates we take with us the rest of your life. Some chose themselves, others chose us. Nonetheless, I hope that we together, in one year, you look back and think that the year was good. We are all in a line. Some went ahead. Others come by. Let’s take care of each other and make the best of every moment. Members of the Norwegian Royal Family Attend Christmas Service in Oslo. On Thursday, December 25, 2015, Their Majesties King Harald V and Queen Sonja of Norway accompanied by Her Highness Princess Märtha Louise of Norway and Mr. Ari Behn along with their two children attended Christmas service at Holmenkollen Chapel in Oslo. Click here to view several photos. 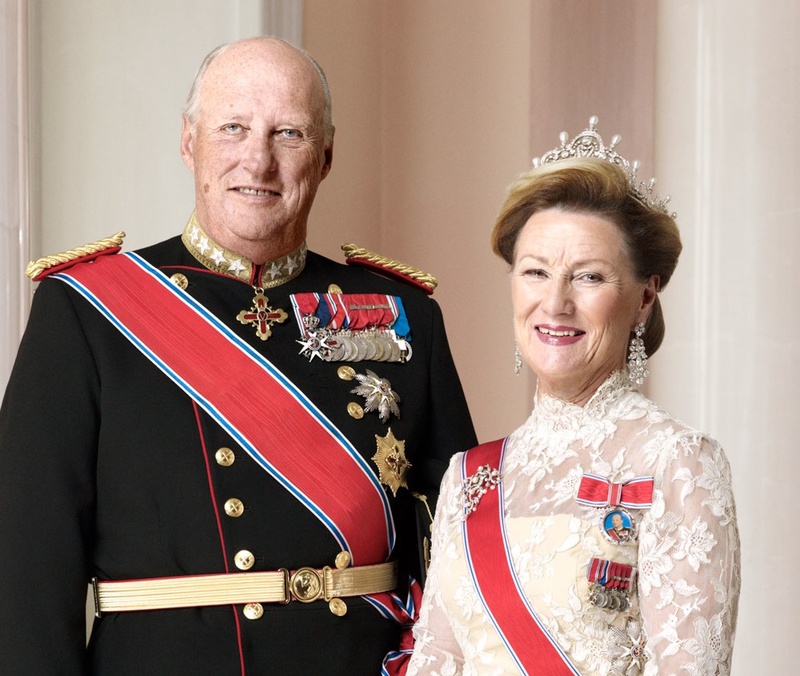 (VIDEO) TMs King Harald V and Queen Sonja of Norway Attend the 2015 Nobel Peace Prize Ceremony. 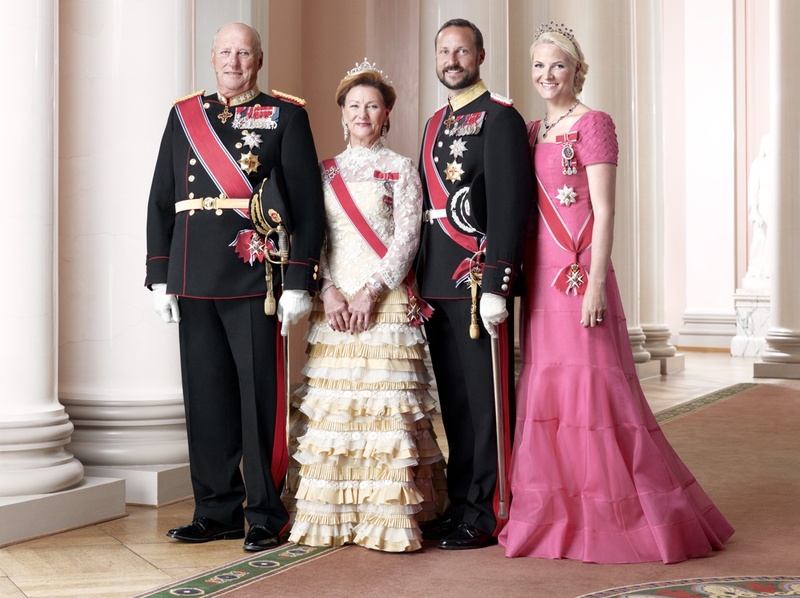 On December 10, 2015, Their Majesties King Harald V and Queen Sonja of Norway accompanied by Their Royal Highnesses Crown Prince Haakon and Crown Princess Mette-Marit of Norway attended the 2015 Nobel Peace Prize ceremony held at the Oslo City Town Hall in Oslo, Norway. 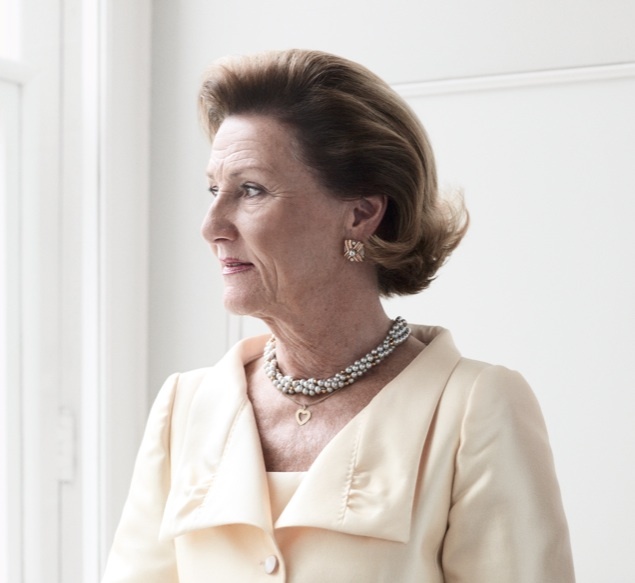 HM Queen Sonja of Norway Attends a Special Mass in Oslo. On Thursday, December 3, 2015, Her Majesty Queen Sonja of Norway attended a special Mass at the Church of St. Olav in Oslo. The Mass was held in remembrance of the innocent victims of the November 13, 2015, Paris terrorist attacks. 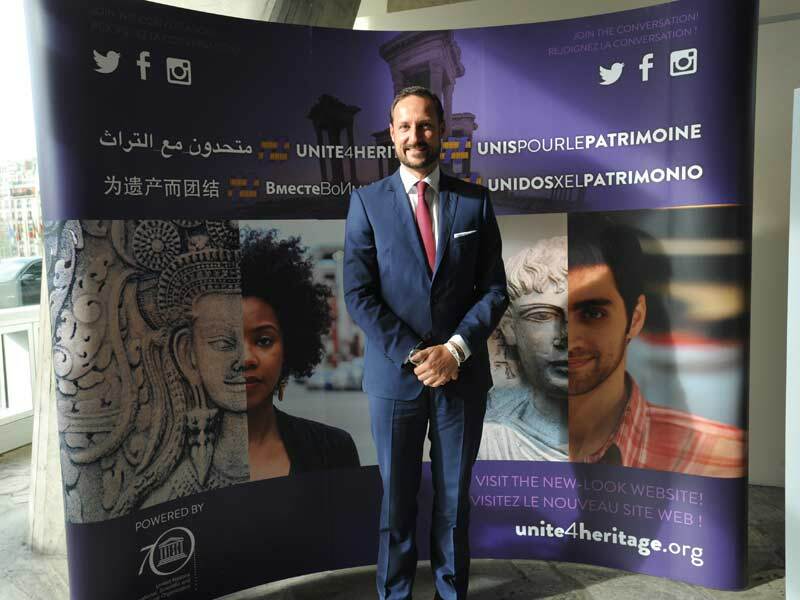 (VIDEO) HRH Crown Prince Haakon of Norway Visits Paris, France. 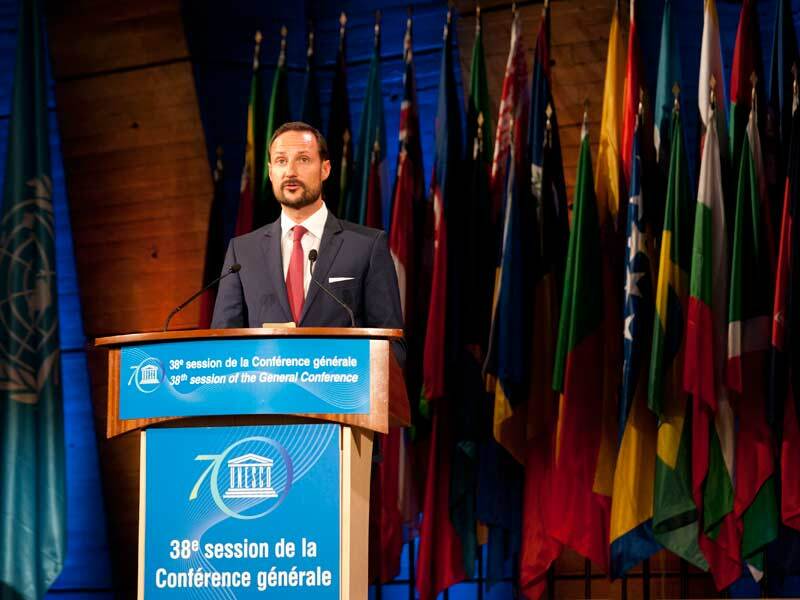 On the afternoon of Tuesday, November 3, 2015, His Royal Highness Crown Prince Haakon of Norway arrived in Paris, France to celebrate the 70th anniversary of the United Nations Educational, Scientific and Cultural Organization (UNESCO) as well as to participate in the opening ceremony of the 38th session of UNESCO General Conference. 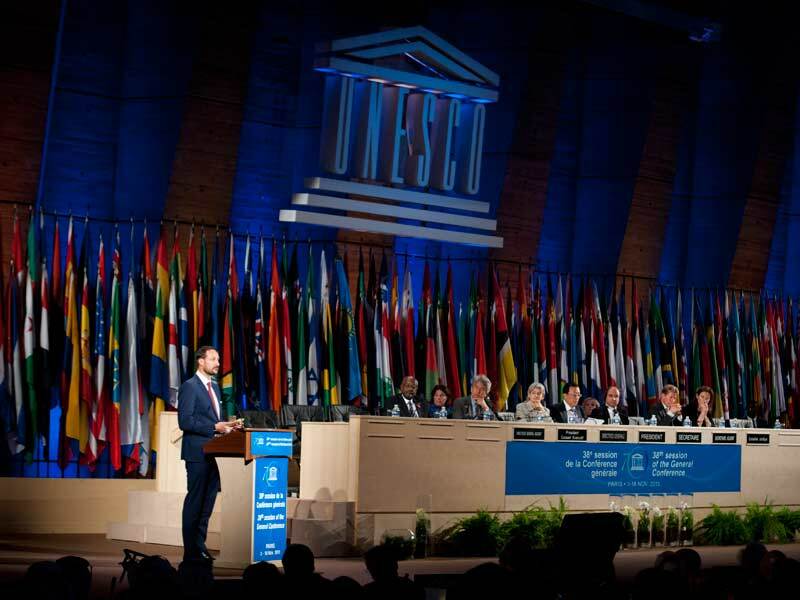 “…held meetings with representatives of the Organization’s Culture sector on the need to protect cultural heritage and UNESCO’s campaign, Unite4Heritage. He also met with representatives from the Education sector on the importance of education for sustainable development and global citizenship. 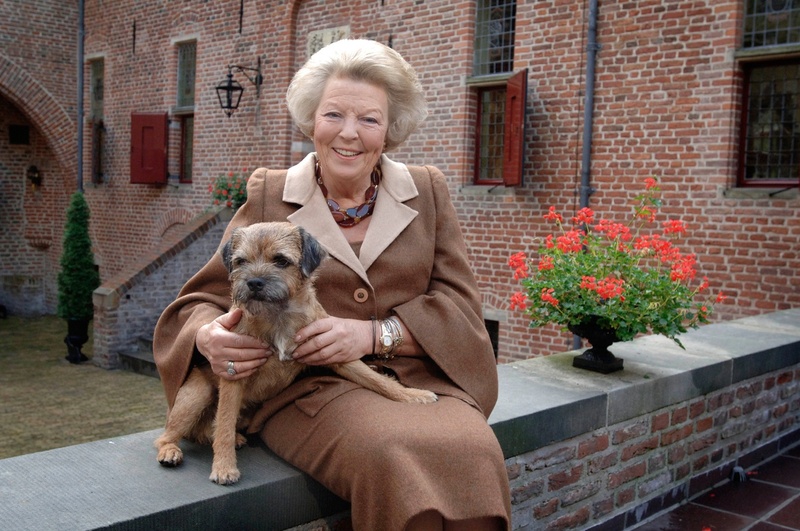 (VIDEO) HRH Princess Beatrix of the Netherlands Opens an Exhibition in Amsterdam. On Wednesday, September 23, 2015, Her Royal Highness Princess Beatrix of Netherlands accompanied by Her Majesty Queen Sonja of Norway officially opened the exhibition, Munch:Van Gogh, at the Van Gogh Museum in Amsterdam. “…the parallels between two iconic artists, Vincent Van Gogh and Norwegian artist, Edvard Munch. Their visions on life and art are closely related, despite the fact that they never met. Their work is colourful, intense, expressive and radical. Their lives are remarkably similar in many ways. Munch: Van Gogh will open to the public at the Van Gogh Museum in Amsterdam on September 25-January 17, 2016. A Royal Gathering in Norway. 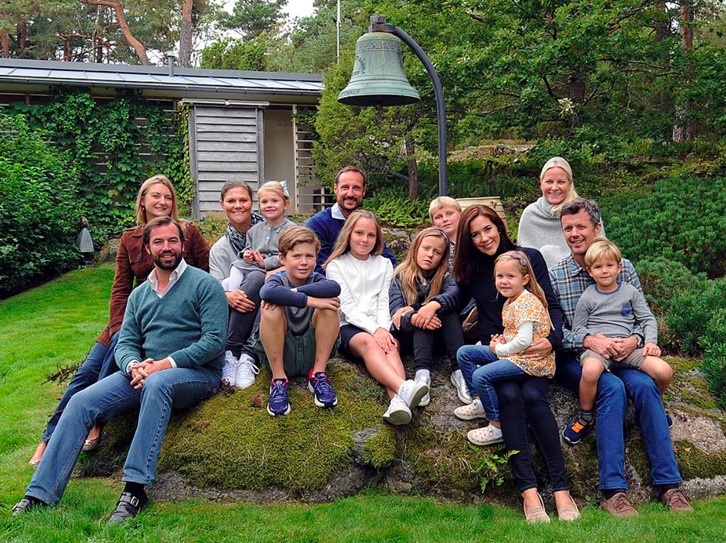 Over the weekend Their Royal Highnesses Crown Prince Haakon and Crown Princess Mette-Marit of Norway hosted a “royal heirs gathering” of sorts at their modest summer home, Mågerø. Attending the royal get–together were TRHs Crown Prince Frederik and Crown Princess Mary of Denmark and their four children, HRH Crown Princess Victoria of Sweden and her daughter, HRH Princess Estelle, TRHs Hereditary Grand Duke Guillaume and Hereditary Grand Duchess Stéphanie of Luxembourg, HRH Princess Ingrid Alexandra of Norway, and HH Prince Sverre Magnus of Norway. Unfortunately, HRH Prince Daniel of Sweden did not attend the gathering. According to the Norwegian royal court, the prince had a cold. (VIDEO) European Royals Celebrate the 200th Anniversary of the Royal Yacht Squadron. 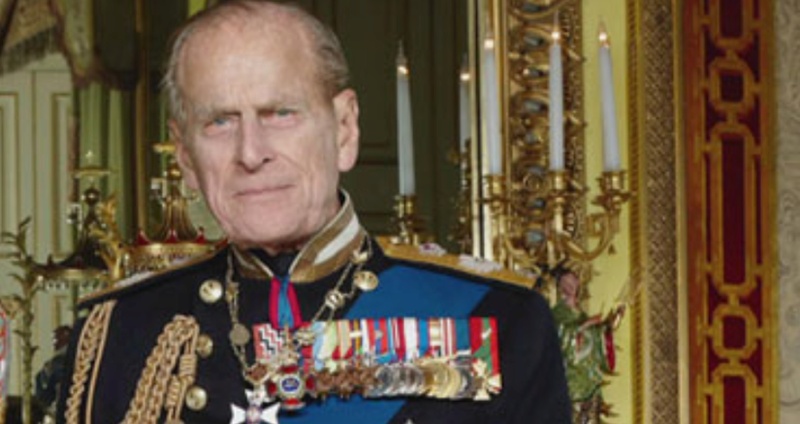 On Friday, June 5, 2015, His Royal Highness The Duke of Edinburgh accompanied by Her Royal Highness The Princess Royal and Vice-Admiral Sir Timothy Laurence, Their Royal Highnesses The Earl and Countess of Wessex, His Royal Highness Prince Michael of Kent, His Serene Highness Prince Albert II of Monaco, His Majesty King Harald V of Norway, and His Royal Highness Prince Henrik of Denmark celebrated the 200th anniversary of the Royal Yacht Squadron in Cowes, Isle of Wight, England. Since 1948, The Duke of Edinburgh became a member of the Royal Yacht Squadron, and in 1953 he became Admiral of the RYS. For more information about today’s celebrations as well as to watch a video and to view photos please click the links below. 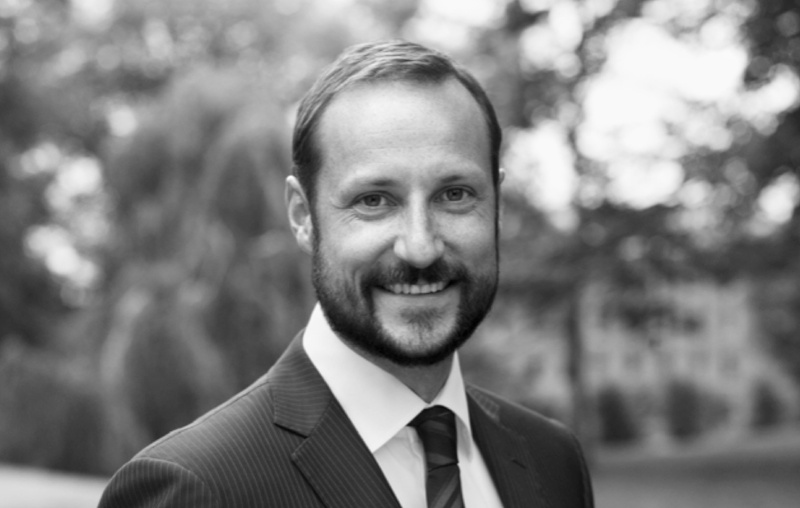 News Regarding HRH Crown Prince Haakon of Norway. On Thursday, May 28, 2015, His Royal Highness Crown Prince Haakon of Norway attended the 75th anniversary celebrations of the liberation of Narvik. If you are interested in learning more about the Battles of Narvik (aka the Norwegian Campaign) please click here and/or here. To view photos from today’s event please click here and here.